Welcome back to our ongoing Game In Progress review of The Legend Of Zelda: Breath Of The Wild. Over the next few weeks, Gameological Editor Matt Gerardi will be playing through the Switch version of Nintendo’s latest fantasy epic and checking in with reports along the way. This second installment, which is as spoiler-free as possible, covers everything from leaving the Great Plateau to his first encounter with the closest thing the game has to a dungeon—a span of around 25 hours. 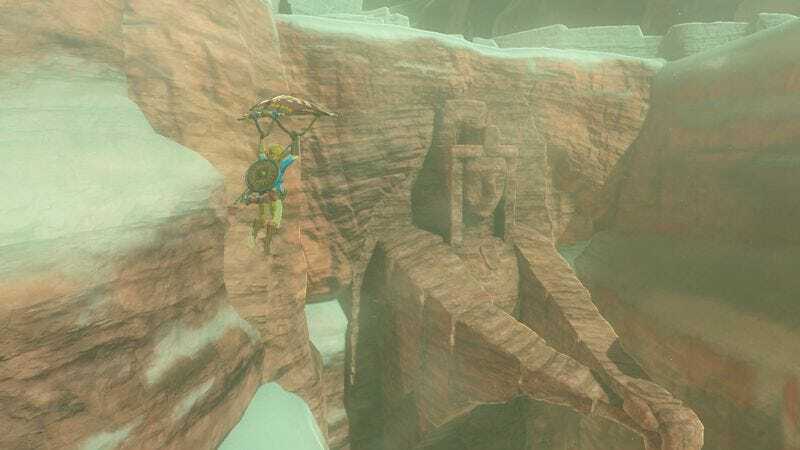 As always, we invite you to read, comment, and play along as we march our way toward Calamity Ganon, whatever the hell that means. Can exploration be its own reward? That’s the question at the center of The Legend Of Zelda: Breath Of The Wild’s ambitious reconsideration of what an open-world game has to be. Nintendo has taken that template, one that was abused to the point of impotency in the last decade, and not so much reinvented it as reassessed its priorities. Many of its conventions are in there, but BOTW approaches this crowded genre with a more minimalist philosophy, and the result is a game that conveys a sense of discovery and satisfaction unlike anything else. Dozens of hours into it, and with no feasible end in sight, it’s safe to say the answer to that question is a resounding yes. At this point, to talk about the specifics of what I’ve encountered below The Great Plateau would be to betray Breath Of The Wild’s appeal. With its near-total lack of guidance and a world that’s orders of magnitude larger than any Zelda game—or most any game, for that matter—its most impressive achievement is an innate ability to surprise. Every time I began to feel like I had a grip on what Hyrule had to offer and how Link’s quest to rid the land of evil might play out, I’d stumble across some heretofore unimaginable thing that shatters my entire notion of what this game is capable of. The further you push yourself into its world, the more of its layers Breath Of The Wild peels back. Those moments are as thrilling as they are reality-breaking, a reminder that something fantastical could be at the top of any mountain or beyond any waterfall. What makes those moments so powerful is Hyrule itself. Its relative emptiness and the way you’re forced to trudge through it on foot if you want to get anywhere new—you can teleport around to some locations you’ve found and you can ride a horse, but it should go without saying they can’t climb mountains or swim across lakes—is sure to grind on some players, but it serves a purpose. It lulls you into a sense of normality that allows those revelatory moments to be as shocking as they are. It’s a better realization of the concept No Man’s Sky was founded upon and, perhaps, took too far: Discovery requires downtime. If everything you trip over feels special, then nothing is special at all. And the game is set up to nudge you toward adopting that slow-burn mentality. Breath Of The Wild does have hunt-and-gather style side-quests, complete with exclamation points over the heads of characters who dole them out. But unlike most open-world games, there’s no leveling up or experience points to earn. The rewards are usually as pointless as the chores themselves, making your checklist of menial drudgery the last place to look when you’re figuring out what to do next. Your actual objectives—aside from the ones you constantly place for yourself as you’re out and about, spying all kinds of sights you want to visit or treasure you want to plunder—are broken down into, what seems to be at this point, two game-spanning main quests that’ll take you all over Hyrule. One of them sees Link trying to locate specific views based solely on a photograph. You can find a man who’ll verbally give you vague directions, but mostly, it comes down to your willingness to explore and your ability to recall landmarks. For example, one photo contains a recognizable bridge and Hyrule Castle in the background. So I headed to the lake my gut felt it was pointing to and followed the perimeter until I came across the gnarled tree and strange statue in the photo. Eureka! This is an ingenious way to get players thinking about the world around them. You’re forced to consider distance and direction and geography, finding the perfect spot to reassemble the composition you’re after. It’s an opportunity to appreciate how attentively crafted every inch of this place feels, and an example of how impactful that craft can be. It’s even more impressive when you accidentally wander into one of those photo locations for the first time and are struck with immediate deja vu, realizing you’ve seen that stone archway or lakeside birch grove somewhere before. From there, it’s just a matter of taking a closer look. Together, all of these decisions reflect a creative outlook that’s refreshing in its simplicity and confidence, both in the environment Nintendo has created and for the players they’ve invited to march through it. The willingness to step back and let you enjoy Hyrule for what it is and on your own terms has led to a new benchmark for pure exploration in video games. There really is a sense that, even from the moment you paraglide down from the Plateau and start your adventure in earnest, you can go anywhere and do anything if you try hard enough. At the end of that personal quest you might find something magnificent or something utterly mundane, but after all these hours—and by all accounts, I still have tons more to go—I’ve yet to be let down either way.